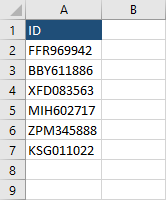 Whether you want to display the first x characters from the identification card or a zip code there are a few ways you can achieve this. In this case, we deal with an identification number which always starts with three letters and six numbers after that. 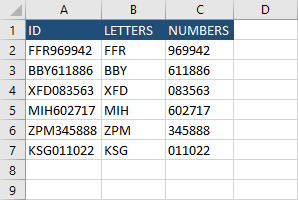 To get the first three letters to use this formula. For the numbers, we are going to use the RIGHT function. Now, we are going to deal with the more complicated problem. 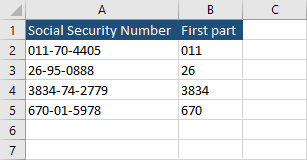 The example below shows numbers separated by dashes. We want to get the first part of the number. We can’t get the first x numbers because the number of characters before the dash is not constant. But we can modify the formula to do the job. The FIND method returns the position of the first dash minus 1. In the previous example, we could see how to get the first characters before a specific character. Now we are going to get a fixed number of characters after a character. The LEN function gets the number of characters minus the first occurrence of the dash. 11 – 4 = 7. In other words, the formula gets 7 characters from the RIGHT.